Council of Canadians celebrates the end of Energy East! We have been fighting this project since February 2013! TransCanada Corp. is actively promoting plans for the “Energy East” pipeline that would carry 1.1 million barrels of crude per day, including crude from the tar sands. TransCanada would convert its 40 year-old natural gas pipeline from Saskatchewan to Ontario, connecting it with new pipeline through Quebec and on to Saint John, New Brunswick. 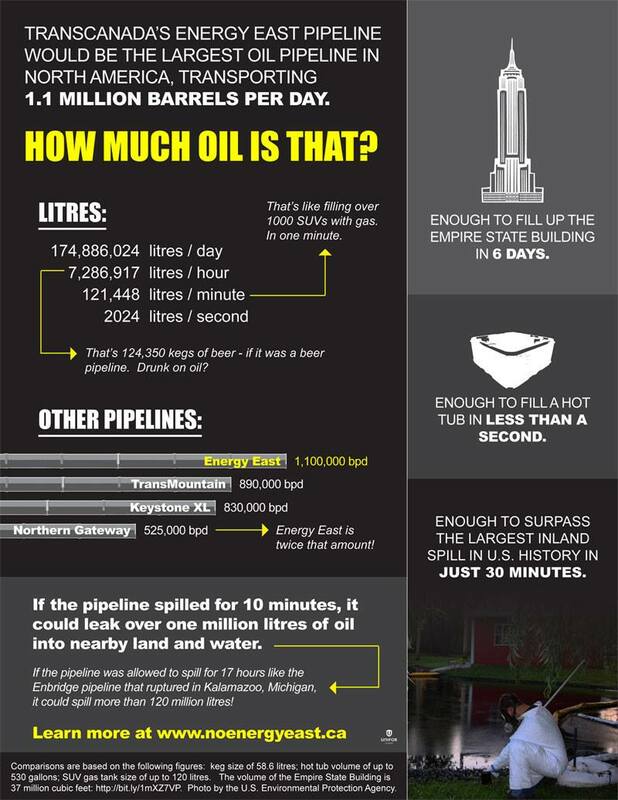 The 4,400 kilometre pipeline is expected to lead to massive tanker exports from the Atlantic coast to send crude to the much larger and more profitable markets of Europe, India, China and the U.S. Infographic: How much oil is that? Pipelines spill. Converting an existing pipeline heightens spill risks in Saskatchewan and Ontario, and a diluted bitumen spill threatens irreversible damage to our precious waterways. Reckless tar sands expansion. Energy East is the biggest pipeline proposal in Canada to date, and is part of a much larger pipeline push by Big Oil. It is a critical part of industry plans for a threefold expansion of the tar sands. Fracking our future. In addition to transporting fracked Bakken shale oil – the substance that exploded in the Lac Megantic tragedy – Energy East would make Ontario and Quebec more reliant on fracked gas imports. Communities also have the right to say “no.” Communities in B.C. and the U.S. are rejecting export tar sands pipelines, why should Eastern Canadians bear these risks? Ontario and Quebec may face energy shortages. Energy East could lead to dramatic reductions in access to western gas for Ontario and Quebec, which could increase costs and cause shortages. Runaway climate change. Swift action is needed to address climate change. Tar sands crude produces even more pollution than conventional oil. Any tar sands expansion would significantly contribute to Canada’s greenhouse gas emissions. A bad investment. Investing in fossil fuel infrastructure detracts from needed investments in a green energy future. Export pipelines make big bucks for Big Oil. Energy East is primarily about getting western crude to eastern coastal waters. Why? Faced with fierce opposition to tar sands pipelines in B.C. and the U.S., Big Oil needs to find a different way to get its crude to international markets. If the pipelines can’t go west, Big Oil will send them east to ship to international markets in order to maximize profits. The Council has been organizing to stop Energy East since the first day it was announced. The opposition of communities and organizations has played a decisive role in halting the controversial project. I first heard the expression “from NIMBY (not in my back yard) to NOPE (not on planet earth)” from Ben Gotschall, a rancher and Energy Director with Bold Nebraska. The Council of Canadians Fredericton and Saint John chapters gathered at the Nashwaak River on June 10 to oppose the Energy East pipeline. The Council of Canadians is available for comment on the National Energy Board (NEB) decision to include both upstream and downstream greenhouse gas emissions in the upcoming review of the 1.1 million barrel per day Energy East project. We have been calling for the full climate impacts of the Energy East pipeline to be considered in the National Energy Board’s review of the project since 2013. On Wednesday the NEB announced that it would do just that. Energy East: Deciphering the NEB review process – Learn about four Energy East review process and how you can participate.